The Mega-Lite Baby Color Q70 is a bright color changing fixture that is ultra compact. 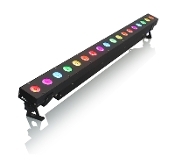 The Mega-Lite N-E Color FX18 is a powerful LED strip with matrix capabilities. It is extremely bright, with 18 3-watt Tri Color LEDs. The fixture is flicker free and displays smooth color mixing.